As we plan accordingly, we might recall, with gratitude, that it was on this date in 1935 that Alan Lane released the first ten titles in the Penguin paperback book series. At the time a junior player at a publisher called Bodley Head, he was frustrated by the lack of affordable contemporary literature. He wanted to offer cheap, quality books through outlets like railway stations and newsagents as well as traditional bookshops– to make good books accessible. So his volumes were priced at 6 pence each, while the typical hardcover book sold for 7 and 8 shillings. 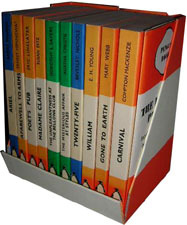 The experiment was a huge success: within a year, Penguin had sold 3 million paperbacks; skeptics– there were many (an earlier experiments in paperbacks in Germany had fizzled)– had been proved wrong; and Lane launched Penguin as a standalone publisher. The original Penguins are an eclectic mix – a biography of Shelley, a Hemingway classic, a novel set in a pub, a novel about an old lady, two mysteries, an autobiography, and three more rather romantic novels– by authors both still widely read (Hemingway, Dorothy Sayers, Agatha Christie) and not so well remembered (e.g., Mary Webb, E.H. Young, Susan Ertz). Today, 80 years later, more than 600 million paperbacks are sold annually worldwide.